Friends of the Santa Maria Valley Railroad. If you are interested in learning more about the Santa Maria Valley Railroad, please consider joining the Friends of the Santa Maria Valley Railroad. It's a great organization to join to learn more about the railroad and its history and also to get involved. The Friends host presentations and field trips. The Friends is a 501(c)(3) organization where donations of historical artifacts of the Santa Maria Valley Railroad can be tax deductible. 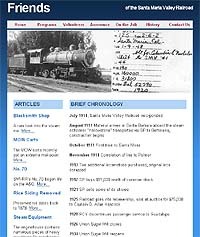 The Santa Maria Valley Railroad recognizes the Friends as the official organization for the preservation of its history. One of the Friends projects is preserving the contents of the Santa Maria Valley Railroad's original blacksmith shop.